As I slipped the SIM card into the Punkt MP 01, I was fully aware that my other assorted devices still had wifi connectivity. Only if I left them behind would I be truly bereft of the myriad digital services that punctuate my day with information, entertainment and connections. 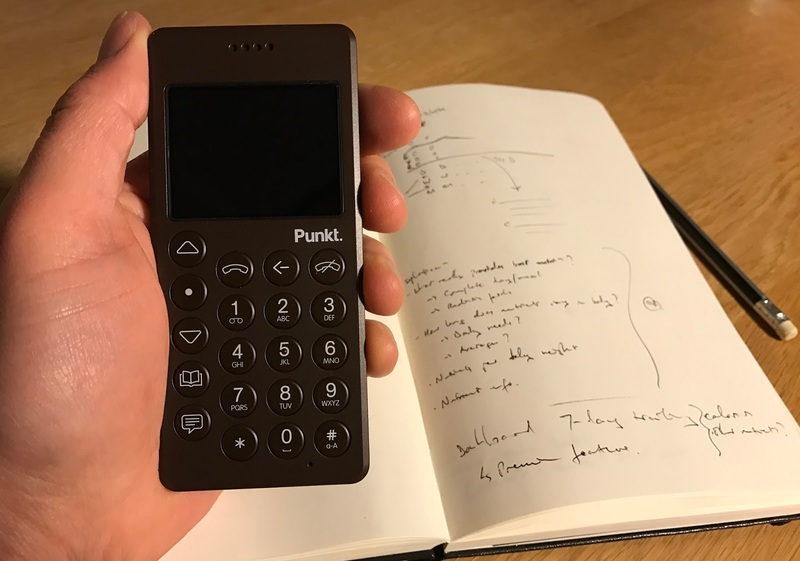 Punkt is a Swiss company based in the beautiful region of Lugano, and the MP 01 is a mobile phone capable of… well, not a great deal really: calls and SMS, alarms and reminders. It has less functionality, in other words, than the Nokia 6100 that I’ve had for about 15 years. The makers call it a ‘dumb phone’. Marek Pawlowski, founder of MEX, had passed the phone to me shortly before Christmas, and I was delighted to receive a device that I thought might help me break from obsessive phone checking: I can’t tell you how often I catch myself picking up my iPhone seconds after I’ve put it down, just to check on… who knows what? Punkt has this to say: “The more our phones do, the more they demand of us. Sometimes it’s good to take a break. But until now, the only alternative to hyper-connected smartphones has been the kind of phone you find at the back of a drawer. The Punkt MP 01 is a stylish, well-crafted mobile phone which focuses on modern simplicity, inside and out. It makes phone calls and sends texts. That’s all.” Perfect, I thought. As I unboxed the phone, noting the 1970s retro-styling, I opened up the fat little instruction manual and turned to the heading “Inserting a SIM card”. Immediately, I encountered the first problem: “the MP 01 is designed to be used with a Micro-SIM (3FF) only… Incompatible SIM cards can damage the card or device…”. My iPhone 7 uses a Nano-SIM. So Christmas was a digitally-enhanced event. Taking my iPhone along to the family gatherings, I was able to take various pictures, and share them instantly with one or two friends over WhatsApp and iMessage. And I was able to book a cab home using Uber. Then Marek informed me that there was a Nano- to Micro-SIM converter somewhere in the packaging. I had missed it, although it had been hiding in the same little black envelope in which the SIM tray opener pin (does this thing have a name?) was to be found. To be fair to Punkt, the manual does also say: “Permanent use of SIM adapter is not recommended.” However, the omission of the definite article (“the”) leaves some ambiguity. A short time passed and I found myself back at work, unable to relinquish my smart device. The MP 01 remained in its box. Until last weekend. I was going to see a preview of the film Fences, followed by a Q&A with Viola Davis, who plays the principal female character. The plan was to put the SIM into the MP 01, and head down to the BFI. Who needs a phone at the cinema? But I couldn’t do it. Despite the fact that my iPhone always goes into airplane mode before a film starts, and remains so for the duration, I still felt the need to have it with me. The moments around the viewing are where it plays a leading role. At MEX/16, Apala Lahiri Chavan of Human Factors International, made reference to the term ‘unwaiting’, the act of shifting, through a mobile device, to another world. Like many others on the tube, I find myself so immersed in my phone that I would struggle without it: whether it’s communicating via email or text, picking up a signal at each station along the way; or listening to music, from my own library or downloads on Spotify; or scrolling through Twitter and Instagram; or, quite frequently, using the time to compose my own words on the tiny keyboard. Before I even get on the tube, I’m checking Citymapper to ensure I optimise my time by standing at the ideal end of the platform for the exit at the other end. And on this specific occasion, after the film, I took out my phone and snapped a couple of photographs of Viola Davis, which I shared on Facebook and Instagram on my way back home. A recent article in Wired UK rails against the notion of the digital detox: digital devices are not de facto bad for us, and I find myself agreeing, while noting, on the other hand, that there are potential side effects. The huge utility that my device, with the various applications running on it, brings to me is so obvious that to say so seems superfluous. Modifying notification settings is important to avoid being repeatedly distracted while in mid-flow. However, the compulsion just to pick it up and to have a speculative look is more problematic. So is setting out to take some specific action and being drawn elsewhere, whether by a visual notification such as a banner or a badge, or an another, unconscious motive. The solution might be to take short breaks from the iPhone, coping with the Punkt alone. But when? Perhaps I don’t need it when I go to do my groceries, perhaps I don’t need any sort of phone. Then again, I have my shopping list on it, and often make use of the time to listen to a podcast. I don’t carry any sort of device when I’m out running, but on a ramble? Well, in that case I like to take pictures of things I see, and occasionally take notes, but I would have to carry a notebook, pencil, camera… Ironically, I could handle being without the telephony, or the messaging. To make good on my promise to Marek, I finally made the switch. First, I set a reminder. With an iPhone, you can ask Siri to remind you to do something at a particular date and time, at the press of the home button. But when you take away voice activation and a touchscreen interface, you’re left with multi-level, hierarchical decision trees. While these are logical, they are not natural. Yes, of course, we see them in biology: trees, veins etc. But in our daily activities, the rigid, linear paths rarely occur. So the simplicity of the device engenders a particular kind of complexity arising from the unfamiliarity of the system. Creating a contact follows a similar process, and is not particularly difficult. Press the contacts key, scroll to ‘add contact’, ‘create new’, and follow the rest of the steps… But being used to having all the fields visible and appropriately sized, it felt strange to step through each one individually. Of course, with regular use, this sort of thing could become more natural. Next, try typing a text message that says “I’ll call you in 10 minutes”. The lack of a full keyboard on the MP 01 means you input this: 4550225509680460######10#06467*HOME. The multiple # strokes toggle the input mode to enable numerals. I realised it would have been quicker to write “ten” (08360 – zero is a space). There is predictive text, but it is no surprise that txt spk came into existence, along with emoticons, during Nokia’s reign. To send the thing, you have to go through a whole decision tree again, unless you select the contact first, and go down the path before composing the message. Now to make that call. It’s fairly easy to assign numeric keys 2-9 to speed-dial favourite numbers. But you’ll have to remember which is which, because it dials the number instantly, rather than giving you the opportunity to confirm the selection. It is simpler, when you have just one contact in your phone, to press the contacts key, select the contact and hit the ‘send’ key. I will find opportunities to use the MP 01. Perhaps meeting up with friends in the evening. I’ll need to make sure I know where I’m going and how to get there before setting out, but otherwise all should be good. Unless they communicate a last-minute venue change on the WhatsApp group. There are certain things that I instantly loved about the device. The styling first of all is gorgeous. While you might feel ashamed to pull out a 15-year old phone in public, the MP 01 makes a statement. I love the silk matte finish on the chocolatey brown. The shape of the back, with its dimpled surface, is unusual, but it fits very snugly in the hand, and is quite delightful to hold. At 88g it is only slightly heavier than the Nokia 6100, and 50g lighter than the iPhone 7. The screen is big enough for its limited functionality; while the typeface and the range of type sizes are good, albeit in monochrome. It has a micro-USB socket for charging, synchronising with your laptop, and using the handsfree earpiece. Just like the iPhone 7, there is no dedicated headphone jack, and it is Bluetooth-enabled. A few design choices seem strange to me. The mic is at the bottom, off to the right, which could affect call quality. The USB socket has a cover with a rather flimsy looking hinge. I can’t see it withstanding much use. And while I like it that the volume and lock buttons are flush, it would be easier to change the volume during a call if the buttons had some shape for the thumb to find. A moment ago, I picked up an email on my iPhone (over wifi), sent via Paperless Post, inviting me to an event. With one tap, I accepted the invitation; and with two taps, I added all the details to my calendar. Shortly, I will go for a run. When I get back, I will log the time and distance in Strava, and the data will then be imported, via the Health app, to Zingy, in which I’ve been logging today’s food, so that it can calculate my energy expenditure and modify my nutritional requirements for the day. The world has adapted to the smartphone: many pre-existing systems have been uprooted. It is difficult to do things the way we used to do them. It is not only the phone that has changed, but the world itself, both society and individuals. We do things differently, and many of the processes and objects that we once used have disappeared. There was a time when the A-Z was many people’s most helpful possession, residing in handbags, jacket pockets and glove compartments all over the country. Attempting to turn back the clock is about as easy as choosing to heat your home from time to time with coal. The MP 01 is a philosophical statement: it is not a phone. This piece originally appear at mobileuserexperience.com.